Is dental implant in Sydney safe? How long does it last? Dental implants are safe and they are much like your natural teeth. They are typically made of titanium and are accepted by the body and serves as a strong and sturdy foundation for replacement teeth. In addition, it is the only restoration method that stimulates your natural bone underneath the missing tooth. If you take proper care of the implants and if the bone they are fitted to is strong & healthy, you can expect them to last for many years. Review your brushing technique ensure that you are cleaning the area properly. Use special oral irrigation system to reduce plaque accumulation around dental implants and natural teeth. Daily flossing helps you to reach around implants, under bridges and bars so these areas can be easily cleaned. Avoid toothpastes that contain excessively abrasive ingredients like baking soda, stain removers and smoker’s toothpastes. If you have dry mouth, then avoid mouth rinses that contain alcohol. Is there any possibilities that dental implant may hurt? Absolutely no! Since dental implants in Sydney is carried out under anaesthetic placing of the implant is very comfortable and no chances of hurting. Getting sedation makes the procedure easier for you and you won’t feel any pain during the procedure. Researchers have found that smoking greatly decreases the ability of an implant to properly bond within the jawbone. Dental implants take months to fuse with the jawbone while bone, gum tissue, and muscle heal around it. Smoking poses a greater risk to these hard and soft tissues, causing them to become inflamed and unable to properly regenerate. This is the primary reason for dental implant failure and this condition is called as peri-implantitis. Can you list some possible complications with dental implants in Sydney? Undergoing dental implant is very trouble free but there are a few chances that mild issues can occur. While undergoing surgical procedure one may experience bleeding, swelling, infection, bruising, pain etc. This varies from person to person and depends on the number of implants. Sedation is a very safe treatment method and we continuously monitor your oxygen levels and heart rate throughout to ensure risks are kept to a minimum. After getting implants it can take some time to adapt. It is possible to bite your cheek or tongue and you may have a slight lisp for some time. To reduce these complications, wear night guards. Is the dental implant treatment expensive? When comparing to dentures, dental implants are expensive. We offer state-of-the-art high-quality teeth implants at the unbelievably cheap rate of $2,850. We use only Australian-approved high-quality dental implants. What about the financing and payment plans for dental implants in Sydney? Our mission is to make oral surgery affordable and accessible for everyone, nobody should be left in pain with inadequate dental care. IV Sedation is available with an 85% Medicare rebate. We have some very good deals in place with Anaesthetists, and in some cases may only cost you $100 out of pocket. Payment plans and financing options are available to you and can be discussed in your initial consultation. Dental implant in Sydney reduces further tooth loss. It requires lesser time to recover. No need to cut down adjacent teeth. Implants are permanently fixed & won’t loosen. Prevents shrinkage of jaw bones. Why dental implants are the best solution? Fixed bridges and removable dentures are not the best solution because may slip or cause embarrassing clicking sounds while eating or speaking. Fixed bridges often require the partial cutting of adjacent healthy teeth, and removable dentures may lead to bone loss in the area where the tooth or teeth are missing. Moreover, dental implants have an average of 25-year life span while fixed bridges and removable dentures usually need to be replaced every 7 to 15 years. Do I have to continue regular cleaning after getting dental implants? Good oral hygiene continues to be important after implant dentistry procedures. Regular cleaning monitors the structural stability of the implant crowns and the integrity of the bone/post bond. Dentists use special instruments that won’t damage metal surfaces below the gum line during these examinations. Dental implants are teeth that are implanted directly into the jawbone. They’re an excellent alternative to a bridge as they don’t have discomfort that bridges have. Find out more about dental implants and the common myths about them here. 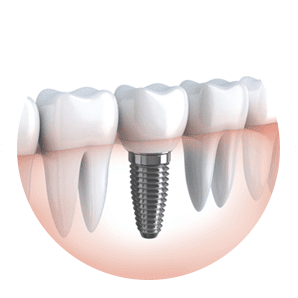 Like any sort of surgery, it varies from case to case but generally speaking, dental implants are a good option for people with missing or severely damaged teeth. If patients practice good oral hygiene and visit their dentist regularly then dental implants should last at least 15 years but often a lot longer. Do implants require special oral care? No. You should treat dental implants just as you should natural teeth. Brush and floss twice a day, visit your dentist for regular check ups and understand the importance of keeping your gums healthy to ensure your implants last as long as possible. The placement of implants is a pain-free procedure. Your oral surgeon will run through your options for during the procedure, which can include sedation and ‘sleep dentistry’. Mild pain medication such as Nurofen or Advil can be taken after the procedure for up to 5 days if needed. The length of the placement will depend on the number of implants being placed. It can take anywhere from 30 mins to 3 to 4 hours. During the first appointment the implant base is usually placed but they are covered under the gum with a temporary denture or bridge in place. After the placement of the implants, patients will need to return 3 to 6 months after the procedure to uncover the implant and have a micro screw installed. Then 2 to 6 weeks after this second appointment, the patient will have the permanent implant put in place and blended with their natural teeth.